On February 1st, 1968 garbage collectors Echol Cole and Robert Walker were crushed to death by malfunctioning garbage trucks. Frustrated by a lack of response by the city, longstanding tensions between disgruntled African American sanitation workers and Memphis city officials erupted on February 12, 1968 when nearly one thousand workers refused to report to work demanding higher wages, safer working conditions, and recognition of their union, local 1733 of the American Federation of State, County, and Municipal Employees. Despite organizing city-wide boycotts, sit-ins, and daily marches, the city's sanitation workers were initially unable to secure concessions from municipal officials. At the urging of Reverend James T. Lawson, Martin Luther King, Jr. agreed to come to Memphis and lead a nonviolent demonstration in support of the sanitation workers. 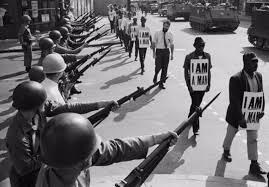 On March 29 over five thousand demonstrators, carrying signs which read "I Am A Man," participated in King's march. However, the peaceful demonstration took a turn for the worse when an estimated two hundred participants began breaking storefront windows and looting. The ensuing violence resulted in the death of Larry Payne, a sixteen year old African American who was killed by Memphis police officers, the imposition of a city-wide curfew, and the mobilization of nearly four thousand National Guard troops. 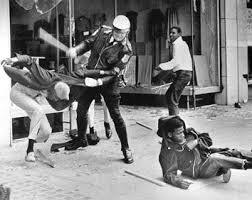 Deeply troubled by the violent outbreak, King vowed to return to Memphis to lead a peaceful demonstration. On April 3, 1968, nearly two months after the initial start of the strike (and against the advice of many of his friends and colleagues), King returned to Memphis and delivered what would be his last public speech. In the wake of King's death, President Lyndon B. Johnson sent James Reynolds, undersecretary of labor, to Memphis to help resolve the strike. Nearly two weeks later on April 16, the Memphis sanitation workers' strike ended when the city agreed to issue raises to African American employees and recognize the workers' union.